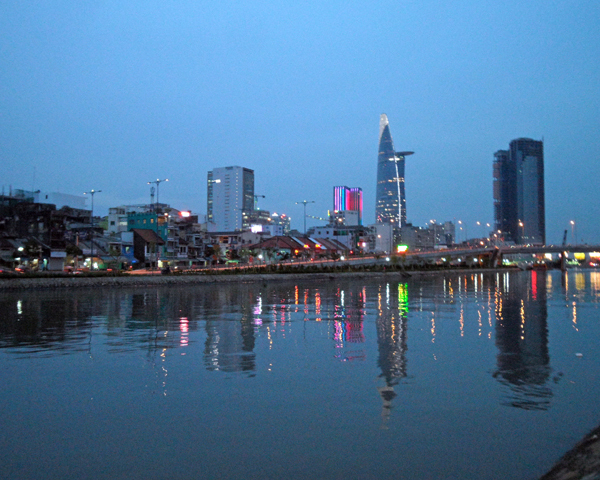 Saigon or Ho Chi Minh City! You pick. We have been here for 3 weeks now but I still feelso far away from being able to write an analyzing or summarizing post. 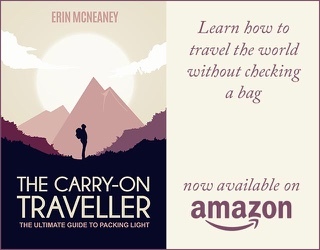 This city – or maybe Vietnam in general – is much different from Thailand and our overall Southeast Asia experience so far. 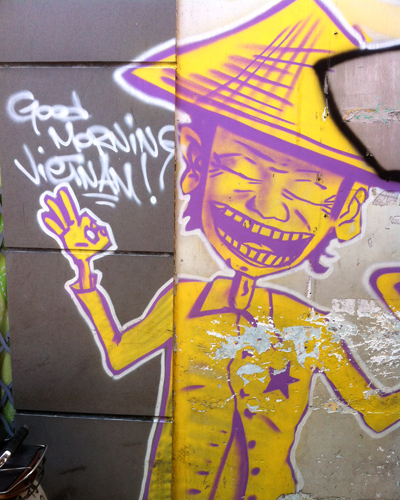 So how about instead of a deep, insightful write up, I’ll share some of our impressions of Saigon so far via pictures? For 2 weeks now we have been staying in a small apartment. The process was actually quite uncomplicated. Luckily, our landlord knows English very well. Two of his children are studying in the States and one studied in Germany(!). This tree is the view out from out door. 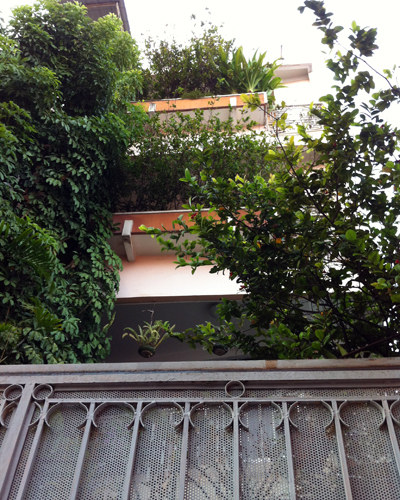 The back of four buildings create this little protected and shady atrium. 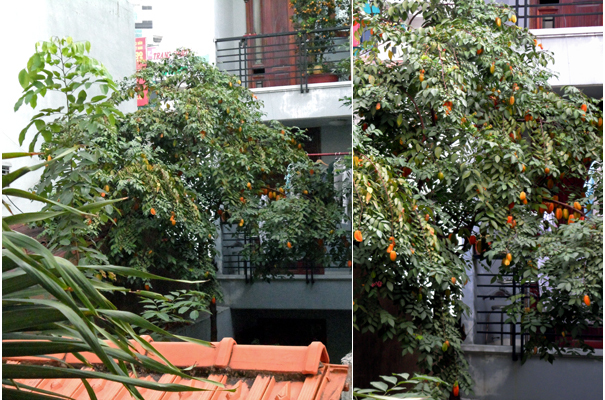 I don’t know if you can see it but this is a star fruit tree with a whole lot of very orange star fruit growing on it. This is the front of our building. It is quite enclosed by greenery which gives refreshing shade. Any shade is very welcome because it is really HOT here. The wall of green on the left is hiding the staircase leading up the different levels. We only have to go up one floor though. Looking down the spiral stair case from our floor. 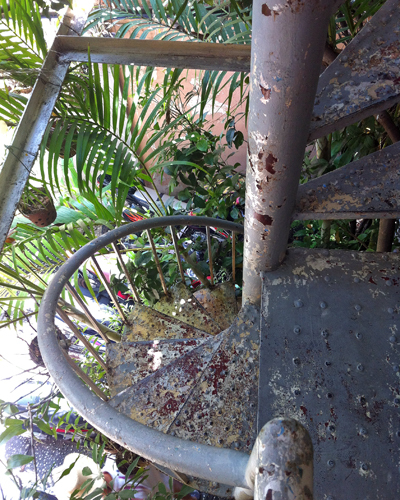 The same spiral stairs from ground level. 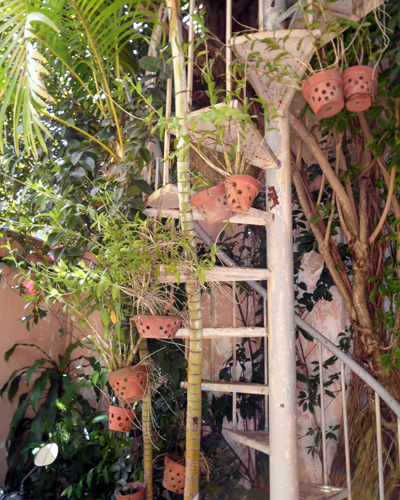 Every day in the afternoon the landlord waters all the plants and flowers creating a very cool and refreshing oasis. One of the four buildings that create the atrium you saw above is this daycare or pre-school. 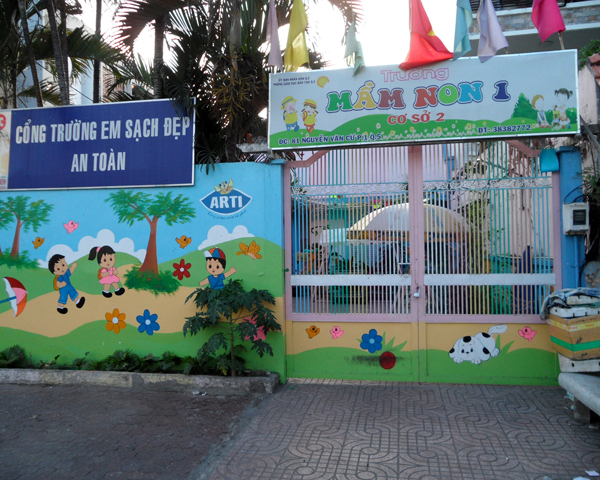 It is quite interesting hearing the little Vietnamese children eagerly learning and reciting things. 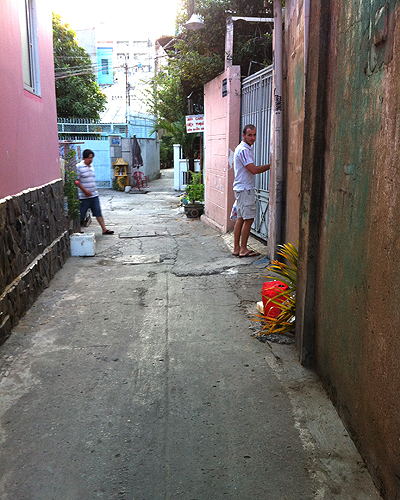 The alley way leading to our building. We are very happy that it is a little removed from the busy main street. 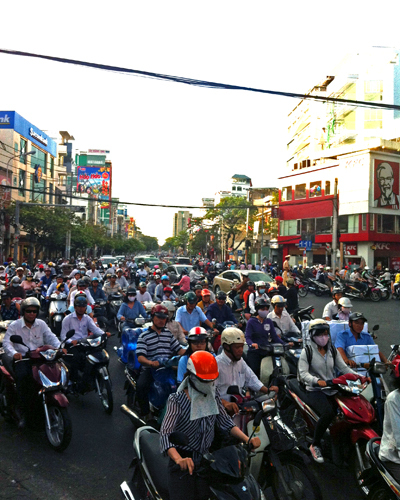 We have never seen so many motorbikes at once as here in Saigon. This is just out from out alley on the main street. Rush hour is when it gets extremely crazy. However, all the traffic is moving quite fast – congestion doesn’t seem too bad. Crossing the streets as a pedestrian here is quite an art. Walking slowly, never stopping and never going backwards seem to be the key elements. Motorbike drivers will just go around you. Have you ever seen the movie “Good Morning Vietnam”? Chinese New Year is also Vietnamese New Year. 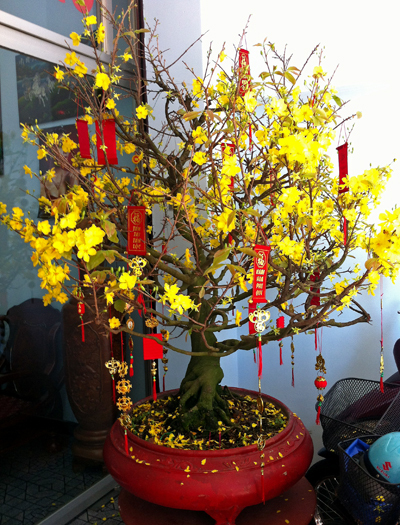 They call it Tet here and yellow flowers and blossoms appear to be a major element of this holiday. During the festivities many house entrances were decorated with plants and trees full of yellow blooms. This little fella (he has a brother too) runs around one of the restaurants we frequent sometimes. 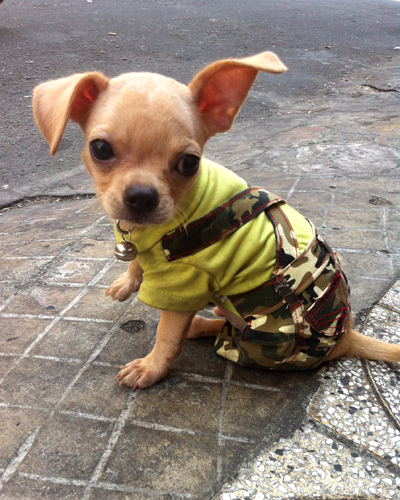 He always sports a new outfit and is very active. It was a challenge getting a picture with him that wasn’t blurry. 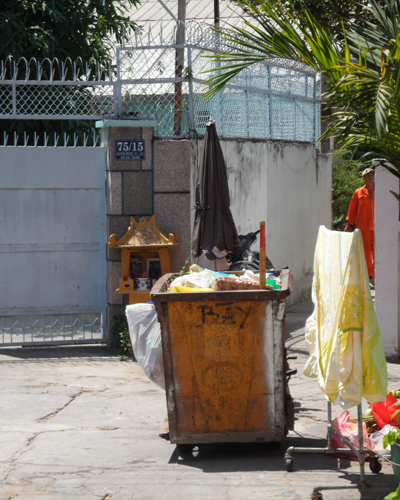 We’ve not yet seen a garbage truck around here – they also wouldn’t fit in most alley ways. Instead there are these bins that the collectors roll around. 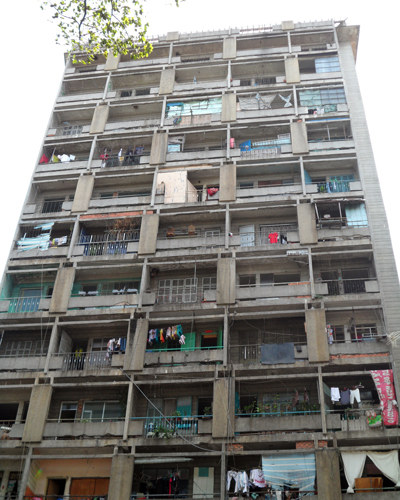 …and then there are buildings like this one that make me think of post-apocalyptic times. Or beautiful architecture that – with the course of time – looks dark and dreary. But pink blossoms can make everything look cheerful again. 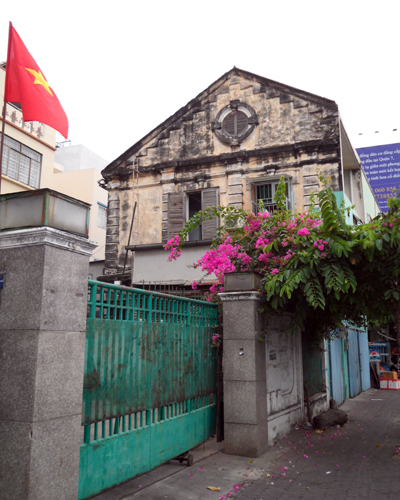 Although Vietnam is officially an Atheist state and a large percentage of the religious population is Buddhist, it is the many Catholic churches that surprise us. 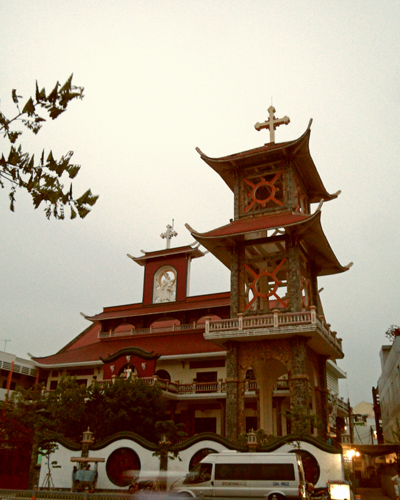 In fact, Vietnam has the second largest Catholic population in SE Asia (the Philippines having the highest). 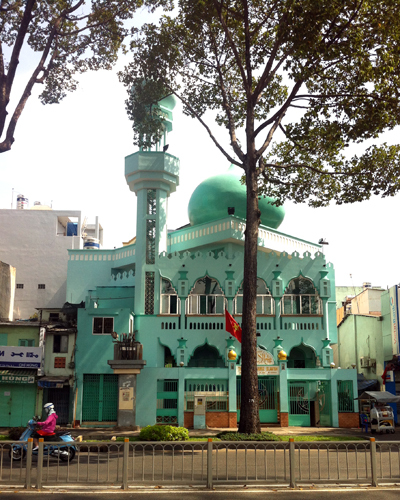 But there also are mosques around – in turquoise (of course!). A summary of my impressions would never be complete without mentioning food. 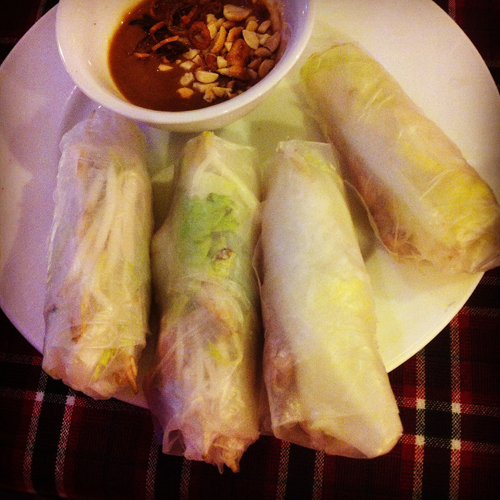 Fresh Vietnamese spring rolls with peanut sauce! 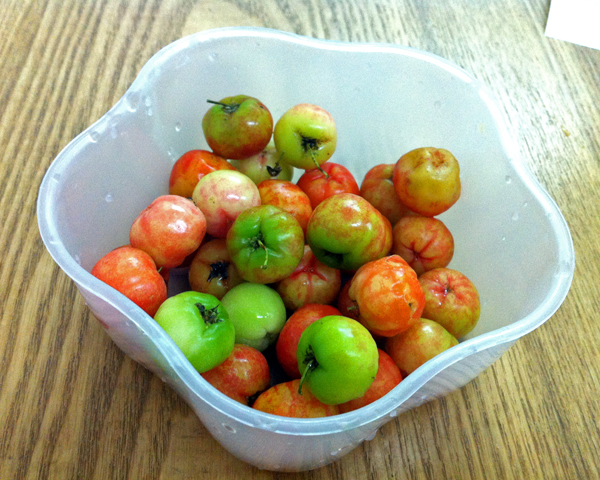 Konrad found these little fruits in the store that he knows from his childhood. He calls them “cherries”. I have never seen them before and they taste much better than I expected from the looks. The green ones are not sour. The fast food joint has burgers and fries but rice and chicken are regular menu items just as well. 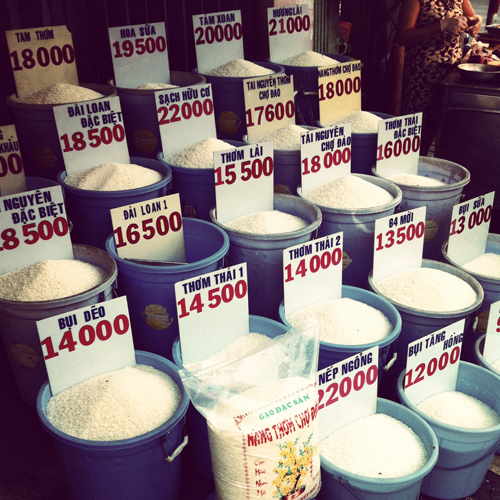 Rice plays a major role in pretty much all of Asian cuisine. I never knew there were so many kinds though. Young coconuts are also all over SE Asia but I have never seen them carved the way as they do here. 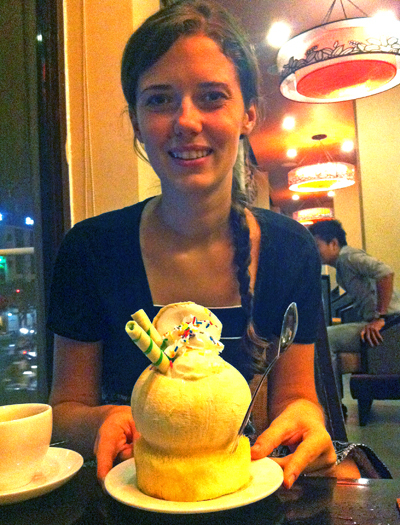 This is ice cream served in a young coconut. Delicious! 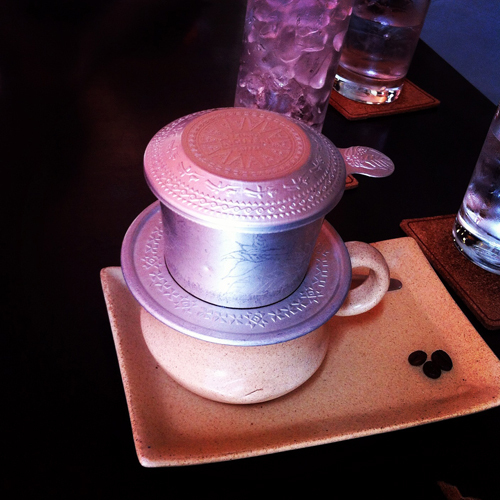 The Vietnamese way of making drip coffee. These are just some of the highlights from our first impressions of Vietnam. We are looking forward to many more experiences and getting to know this country and the people better.